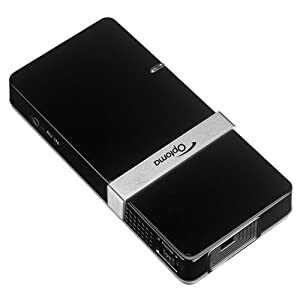 The Optoma EP-PK-101 PICO Pocket Projector – Small enough to fit in your pocket, bright enough to use for small presentations ~ powered by your iPhone! The Optoma Pico is the smallest projector you’ve ever seen! Its compact size and durability make it a must have for travel and on-the-spot presentations. Reviews are fairly mixed, ideal use would be in low-light, which is rather obvious, but could be an interesting option to evaluate if you travel frequently or find yourself giving lots of impromtu presentations (showing off the new whiz-bang iTunes/YouTube video on your iPhone?) or just watching a movie on the back of a seat on the airplane – not to mention giving presentations at a trade show. Note: This configuration does not connect to notebook computers, PC’s PDAs, cell phones or other devices unless the device has composite output. Please make sure to consult your device’s owner’s manual. This entry was posted in Uncategorized and tagged gadget, iPhone, iPod, iTouch, mini projector, Optoma. Bookmark the permalink.